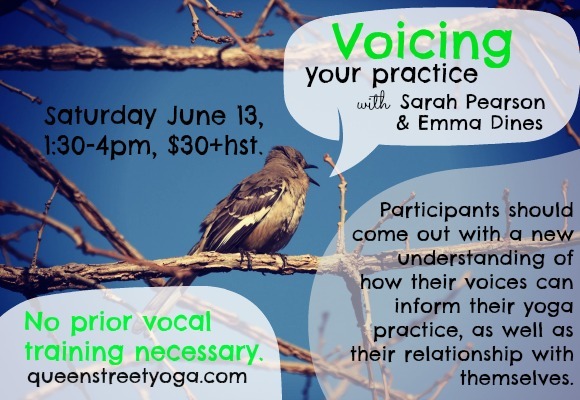 We are excited to be hosting music therapist Sarah Pearson at Queen Street Yoga for a new workshop called “Voicing Your Practice”. She will be collaborating with Emma Dines to bring yoga and voice work together. In this blog post she shares about her passion for exploring the human voice, and how adding sound to our yoga practice might deepen our self-awareness and growth. The voice is a universal human instrument. 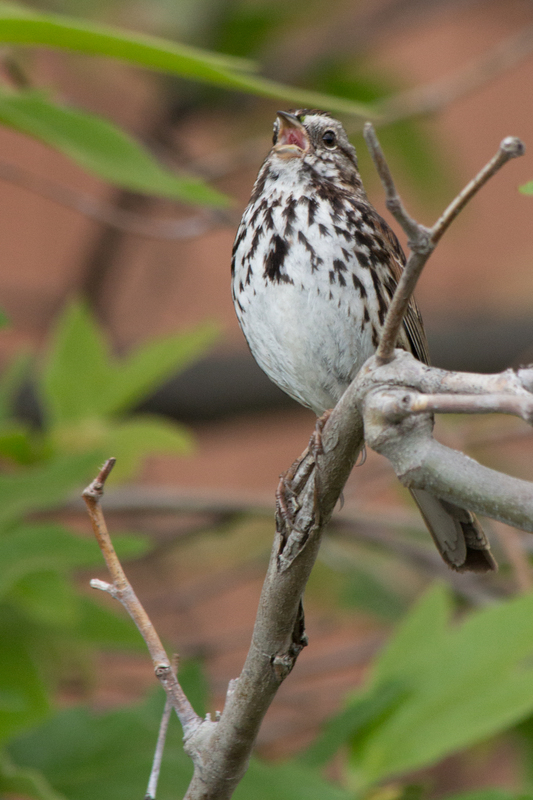 Almost all of us speak, and many of us sing (even if no one’s listening). Voices are also personal and emotional: like our bodies, they reflect our values and culture, our self-perceptions, and the ways we want others to perceive us. Using our voice is as mundane an activity as, say, reaching for a jar of almond butter. We do it without thinking. But our voices, like our bodies, are also shaped by habits. By bringing awareness to those habits, we can determine what habits we want to release, in order for free expression to flow through us. What I love most about yoga (if I really had to pick!) is how it tunes me into a deeper awareness of what already is. If it wasn’t for yoga, I wouldn’t know that I happen to have relatively tight hips but really flexible shoulders, or that I tend to tighten my jaw when I go into a backbend. I wouldn’t feel the connection between my fingers and my toes when I reach for that jar of almond butter. Yoga has cultivated this awareness, and through it, habits have begun to be released, and more flow has entered my life. This process is so similar to the years of work I’ve done as a singer. I am a singer with a history of vocal injury. Like anyone recovered from injury, there are habits I have had to unlearn, muscles I have had to re-train, and intentional change I have had to cultivate through awareness and mastery in order to move through physical pain into freedom. I have spent many hours of my life practicing vocal techniques in soundproof rooms, shared apartments, echoing bathrooms, and stairwells. 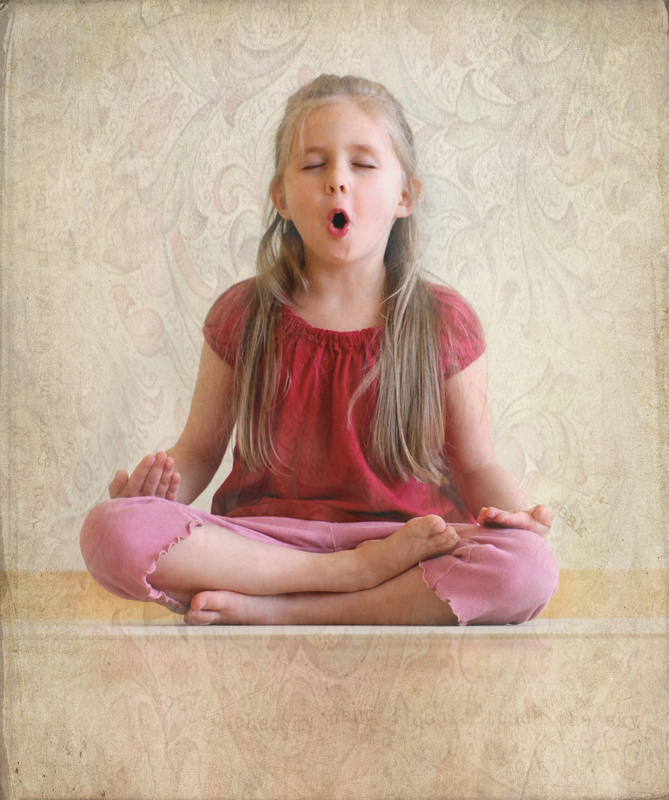 The strange discipline of making weird, intentional vocal sounds in order to build skill and re-train muscles, is very similar to an asana practice. Practicing yoga has supported my voice practice, which together, have taught me a lot about myself. This process of movement and voice work has been so crucial and informative in my life that it influences a lot of what I do as a music therapist. By tuning into their voices through guided and supportive exercises, the clients I work with find a world rich with self-discovery. A woman might discover she has a deep fear of using her chest-voice because it sounds “too masculine,” setting her on a journey to explore her sense of power. A client might discover that he cuts off his speaking voice to resonate merely in his sinus cavity, blocking off flow to entire areas of his body, which might illuminate a fear of being totally present, and a desire to hide and self-protect. Cultivating that physical awareness allows us to move through habits into freedom and flow. On June 13th, Emma and I will begin to explore some of these possibilities for flow by adding a bit of vocal play to our asana practice. We will explore how adding sound to our poses can deepen our expression of the poses; we will begin cultivating an awareness of how we produce sound in our bodies, and how we actually feel about our voices; and we will begin to explore the different voices that we use in our lives – our “parent” voice, our “teacher” voice, our “childish” voice, etc. – where they come from, and how they can help or hinder us. Cultivating awareness of habits leads to a release of the habits, which leads to flow; in our voices and in our bodies. I hope you can come play with Emma and I – we’re excited to see what flow we can bring into our lives by Voicing Our Practice! 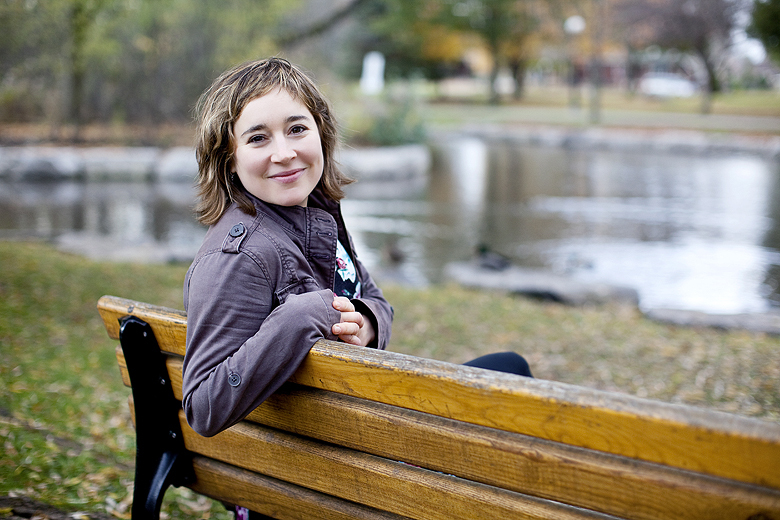 Sarah Pearson is a music therapist working mainly in oncology, palliative care and private practice here in KW. She regularly uses vocal exercises alongside psychotherapy techniques to support her clients on their journey towards wholeness and self-knowing. She is a professional musician, singer-songwriter and trained singer, and part-time faculty in Wilfrid Laurier University’s music therapy program.